The Distribution tab in the Basic Scheduling tool provides the options available for distributing the report output for the scheduled report procedure (FEX). You can distribute a report output using one of the following methods. Distribution methods can be limited globally (for all users) in ReportCaster	configuration and for groups or individual users by security operations. For more information, see the WebFOCUS Security and Administration manual. Distribution of a WebFOCUS Repository report can be limited to the Report Library by selecting the Restrict Schedule to Library Only property. For more information, see Restricting Distribution of Reports to the Report Library. Maps can be distributed to the Library and WebFOCUS Repository only. Maps distributed by Email or FTP do not open correctly. For more information, see the WebFOCUS InfoAssist User’s Manual . If you want to remove trailing spaces from reports distributed in text format, your administrator needs to add the following setting to the Administration Console Custom Settings text box: IBIWF_trimreport=YES. You can also apply this setting to affect only specific report formats, for example, IBIWF_trimreport=WP. When you distribute a report through email, you can include the report in the body of the email (known as an inline email message) or send it as an attachment. Only the HTML, DHTML, WP, and DOC formats can be distributed as an inline email message. Note: You must be authorized to distribute by Email in order to create a schedule that uses Email distribution. Distributing a report as an inline email message is particularly useful when the report is distributed to mobile devices, fax machines, or through email systems that do not support attachments. You can also distribute a report to a Fax machine, as explained later in this section. 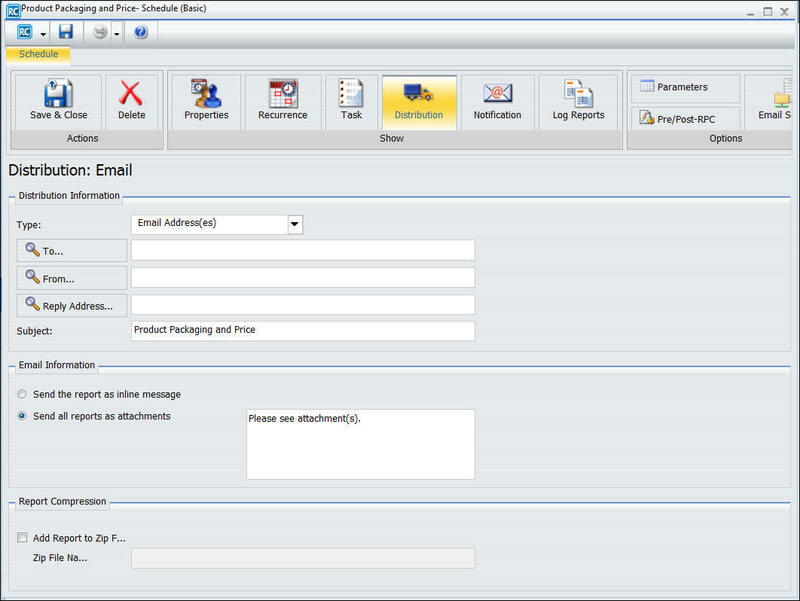 The following image shows the email distribution options in the Distribution tab of the Basic Scheduling tool when the email method is selected. The availability of the inline message option when you create a schedule depends on the Inline Report Distribution setting in the Server Configuration tool accessible from the ReportCaster	Console. The display of a report that is distributed as an inline email message can be affected by settings and restrictions of your email server or email client. For more information, see the Developing Reporting Applications manual. Note: You can use parameters (amper variables) when specifying values in the Email settings of a schedule. These parameters can be system variables, such as &YYMD, or any amper variable for which a value is returned by the Reporting Server when the scheduled procedure is executed. To use the dot file extension separator after a variable terminate the variable with the '|' character (for example, &YYMD|.htm). Similarly, to use the ampersand character itself, follow the ampersand with the '|' character (for example, Smith&|Jones). If a value for a parameter specified in a schedule is not returned by the Reporting Server when the procedure executes, the schedule will fail with a "No report to distribute" error. If the scheduled task is burst, you can also use the '%BURST' symbol to include the burst value. If the Packet Email setting is Yes, the burst value will not be substituted in the Zip filename. Right-click a report procedure (FEX), select Schedule, and then select Email. The Basic Scheduling tool appears. From the Type drop-down list, select the method you will use to provide the email addresses that will receive the distribution. The options are Distribution List, Distribution File, Dynamic Distribution List, and Email Address(es). For more information, see Creating a Distribution List. These options all show where the report procedure (FEX) distributes To, From, Reply Address, and Subject. Additionally, in the Email Information section, select whether you would like to send all reports as attachments or send a report as an inline message. Distribution List. The report will be sent to all email addresses in the selected email Distribution List. For more information, see Creating a Distribution List. Distribution File. Type the full path and file name of the external distribution file you want to use for this schedule. The path and file must be accessible to the ReportCaster Distribution Server. For more information, see How to Create an External Distribution File. Email Address(s). 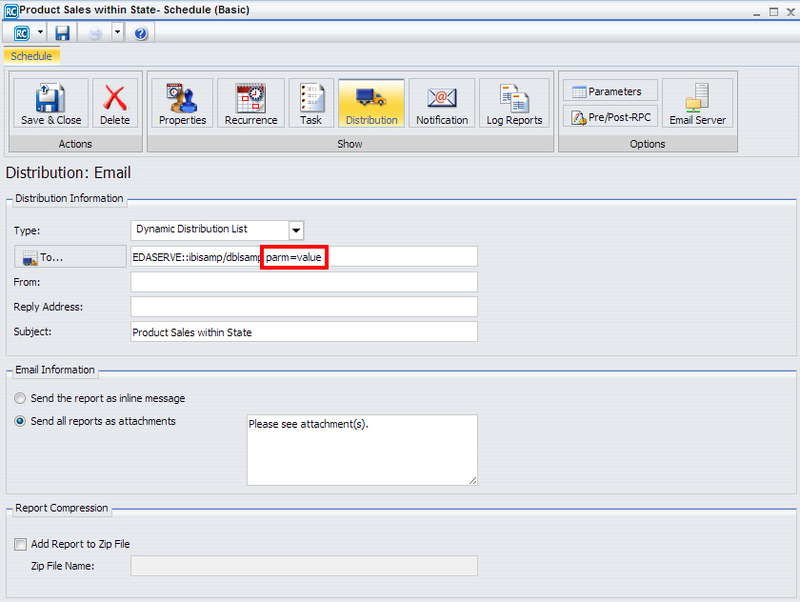 This is the default method for supplying email addresses in the scheduling tools. The default value of this field is the email address of the user that is creating the schedule. You can specify multiple email addresses in the Email Address(s) field. Separate each email address with a comma (,) or a semicolon (;). The email addresses will appear in the To line of a single email when the scheduled output is distributed. Each individual email address can be a maximum of 130 characters, according to the SMTP specification. The total maximum length of this field is 800 characters. For more information, see Specifying Multiple Email Addresses. Additionally, you can use group mail lists (defined on your mail server) with the Email Address(es) option. You can use group mail lists to distribute a report or notification to multiple recipients without having to maintain multiple email addresses in the Repository. The format of the group mail list depends on the mail server being used. For example, if you are using a Microsoft Exchange Server and your group mail list is defined as #group1, you would enter group1@listdomain in the Email Address(es) field. If the group mail list contains a space within its name, enclose the space with double quotation marks ('' ''). For more information, see your mail server administrator. Dynamic Distribution List. You can use a Dynamic Distribution List to return in memory either a list of burst values and destinations, or only a list of destinations from a data source (for example, a flat file, SQL database, FOCUS data source, or LDAP). For more information, see Creating a Dynamic Distribution List. 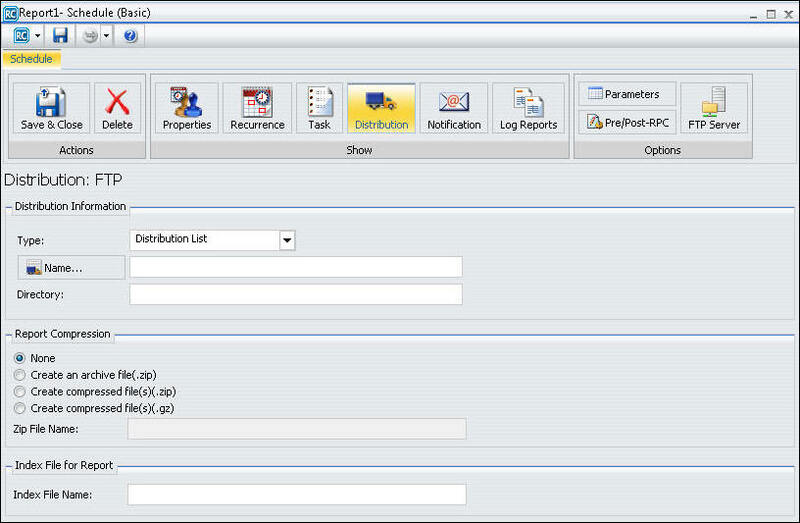 When Dynamic Distribution List is selected, the To field is enabled to facilitate the selection of the Procedure Name. Once a procedure is selected, you can pass a parameter on the command line of the fex, as shown in the following image. In the To box, type the email address of the recipient. In the From box, type any value (for example, the name of the person creating the schedule). ReportCaster	does not require a value for this field, but your email system may require one. In the Reply Address box, type a valid email address. If recipients reply to the email, their messages will be sent to this address. If your email system is unable to deliver the content, the undeliverable output message is also returned to this address. ReportCaster	requires this field. In the Subject box, type the text you want to appear in the email subject line. ReportCaster	may not require this information, but it may be needed by your email system. The value you entered in the schedule Title field is the default Subject value. Specify whether or not you want to send the report as an email attachment or within the body of the email inline by selecting or clearing the Send all reports as attachments option. Optionally, you can type a message to appear in the email body. Specify whether or not to send the report as a compressed (.zip) file by selecting or clearing the Add Report to Zip File check box. By default, the Add Report to Zip File check box is not selected and the Report will not be compressed. If the Add Report to Zip File check box is selected, enter the name of the Zip file in the Zip File Name box. Note: Support of Unicode characters in a Zip file name and content within a Zip file on Windows 7 and Windows 2008 Server R2 requires the following hotfix from Microsoft: http://support.microsoft.com/kb/2704299/en-us. Without this hotfix, file names are corrupted after you decompress a .zip file in Windows 7 or in Windows Server 2008 R2. Select the Notification tab to specify whether to send an email notification of the schedule job status. If you select Always or On Error, then you have to specify the Reply Address, Subject, Brief Message To, and Full Message To. Next, select the Properties tab specify the Title, Priority, whether to delete the schedule if it will not run again, and whether the schedule is enabled to run. For more information, see About Properties in the Basic Scheduling Tool. Select the Recurrence tab to specify how often to run the schedule. If you want the schedule to run on the current day, set the Start Date and Start Time to values later than the current time. For more information, see About Recurrence in the Basic Scheduling Tool. Select Save & Close to save the schedule. Typically, a DHTML report distributed as an inline email message will not render correctly. For example, the following image shows a compound report in DHTML format. The following image shows the previous report sent as an inline email message. The email client does not render the report correctly. As an alternative, you can use the -HTMLFORM command to distribute a report with multiple table requests as an inline email message. The following procedure will produce a report that contains two table requests. The procedure is coded with -HTMFORM. The following image shows the result of the -HTMLFORM procedure after it has been distributed by email in HTML format. For more information about -HTMLFORM, see the WebFOCUS Reporting Language technical content. The Email Distribution Options dialog box enables you to view and assign the Mail Server Name, select an SSL connection for the server, select a TLS connection for the server, require authentication for the server, and assign Account Name and Password. Click the Email Server icon to access Email Distribution Options, as shown in the following image. Mail Server Name. The name of the mail server to be used by this schedule. The default value is set in the ReportCaster configuration tool. This server requires a secure SSL connection. Select this check box if the specified mail server uses SSL. This server requires a secure TLS connection. Select this check box if the specified mail server uses TLS. This server requires authentication. Select this check box if the specified mail server requires authentication with a user ID and password. Account Name. A valid user ID for the specified mail server. Password. The password for the specified user ID. This section provides information about distributing scheduled output using File Transfer Protocol (FTP), as shown in the following image. You must be authorized to distribute by FTP in order to create a schedule that uses FTP distribution. Credentials for FTP servers are stored on a user level when a schedule is created in the same way that Reporting Server credentials are stored. The user needs to enter credentials only once for each FTP server. Those credentials will be available in the Basic Scheduling tool each subsequent time that the user creates a new schedule that utilizes that FTP server for distribution, as shown in the following image. Select Password if the server requires authentication with a user ID and password. Select Public Key to authenticate against the server using Public Key Authentication. There is more than one format for the Public and Private key pair used for authentication to an SFTP Server. If the Public and Private key pair used by your SFTP server is in a format that is not recognized by the Distribution server, you can generate keys in the appropriate format with the sshkeygen utility on the Distribution server. For more information, see the WebFOCUS and ReportCaster Installation and Configuration for Windows manual. The Private Key for the server using Public Key Authentication must be added to the sftp_private_key.txt file, which is located in the \cfg directory on the Distribution Server. Note: You can use parameters (amper variables) when specifying values in the FTP settings of a schedule. These parameters can be system variables, such as &YYMD, or any amper variable for which a value is returned by the Reporting Server when the scheduled procedure is executed. To use the dot file extension separator after a variable terminate the variable with the '|' character (for example, &YYMD|.htm). Similarly, to use the ampersand character itself, follow the ampersand with the '|' character (for example, Smith&|Jones). If a value for a parameter specified in a schedule is not returned by the Reporting Server when the procedure executes, the schedule will fail with a "No report to distribute" error. If the scheduled task is burst, you can also use the '%BURST' symbol to include the burst value. If the multiple reports are distributed in one archive file, the burst value will not be substituted in the Zip filename. Right-click a report procedure (FEX), select Schedule, and then select FTP. Enter a title in the Title box or leave the default. Optionally, enter a summary in the Summary box. Distribution List. The report will be sent to all FTP addresses in the selected Distribution List. For more information, see Creating a Distribution List. Single File. Type the name of the fully qualified path and file name to the file containing the file names to distribute. ReportCaster	cannot validate the file existence. The burst option is not supported with this distribution option. The maximum length of this field is 800 characters. Dynamic Distribution List. A Dynamic Distribution List enables you to return in memory either a list of burst values and destinations, or only a list of destinations from a data source (for example, a flat file, SQL database, FOCUS data source, or LDAP). For more information, see Creating a Dynamic Distribution List. In the Report Compression section, specify options by which to compress the report. Select Create an archive file (.zip), Create compressed file(s)(.zip), Create compressed file(s)(.gz), or accept the default, None. The default setting for Report Compression is derived from the configuration settings. For more information, see Zip Settings. Without this hotfix, file names are corrupted after you decompress a .zip file in Windows 7 or in Windows Server 2008 R2. Select the Notification tab to specify whether to send an email notification of the schedule job status. If you select Always or On Error, you must specify the Reply Address, Subject, Brief Message To, and Full Message To. Select the Properties tab to specify the Title, Priority, whether to delete the schedule if it will not run again, and whether the schedule is enabled to run. For more information, see About Properties in the Basic Scheduling Tool. Select the Save & Close button. The report formats that support printing are DOC, PDF (when you configure ReportCaster	to enable PDF to print and the printer has the appropriate driver), PS, and WP. The following image shows the printer distribution options in the Distribution tab section of the Basic Scheduling tool. You must be authorized to distribute to a Printer in order to create a schedule that uses Printer distribution. Problems may occur in printed output if the distributed reports contain UTF-8 characters. Note: You can use parameters (amper variables) when specifying a value for the Printer Name field of a schedule. These parameters can be system variables, such as &YYMD, or any amper variable for which a value is returned by the Reporting Server when the scheduled procedure is executed. To use the dot file extension separator after a variable terminate the variable with the '|' character (for example, &YYMD|.htm). Similarly, to use the ampersand character itself, follow the ampersand with the '|' character (for example, Smith&|Jones). If a value for a parameter specified in a schedule is not returned by the Reporting Server when the procedure executes, the schedule will fail with a "No report to distribute" error. If the scheduled task is burst, you can also use the '%BURST' symbol to include the burst value. Right-click a report procedure (FEX), select Schedule, and then select Printer. Distribution List. The report will be sent to all printers in the selected Distribution List. To select a Distribution List, click the icon next to the Distribution List field. Distribution File. Type the full path and file name of the external distribution file you want to use for this schedule. The path and file must be accessible to the ReportCaster Distribution Server. For more information, see Creating an External Distribution File. Printer Name. Specify the printer using the following format. Is the name of the printer queue. Is the host name or IP address of the printer. ReportCaster	can differentiate between the printer queue and the printer host name or IP address due to the presence of the '@' separator. Although ReportCaster	supports specifying only the host name or IP address of the printer, we recommend that you specify both the printer queue and host name or IP address when distributing ReportCaster	output to a printer. The maximum length of this field is 800 characters. If you select Distribution List, click the Name button, which will display the Open dialog box to allow you to select a Distribution List. If you select Distribution File, specify in the Name field the fully qualified path and file name where the external Distribution File is located. If you select Printer, specify the printer name in the Name field. Select the Notification tab to specify whether to send an email notification of the schedule job status. If you select Always or On Error, then you must specify the Reply Address, Subject, Brief Message To, and Full Message To. Select Save & Close to save your changes. The Report Library provides secure access to distributed report output stored in the Repository and allows you to save multiple versions of the same report output, set an expiration date, and keep a specified number of versions. The Report Library is only available to users who are authorized to access and view the Library reports in the folder location in which they are stored. You must be authorized to distribute to the Report Library in order to create a schedule that uses Report Library distribution. It is not recommended to change the owner of a schedule that has already distributed a Library report. You cannot change the ownership of the existing Library report. You can send an email notification informing users authorized to access the Library report of its availability. This will notify these users each time a new version is distributed and provide a URL to directly access the new version. When creating a schedule for distribution to the Report Library, you select the folder to which the report output will be distributed. Using the Advanced button, you can optionally specify a subfolder to which the output will be distributed. If the subfolder does not exist, it is created dynamically during distribution of the initial schedule execution. During subsequent executions of the schedule, reports are distributed to the existing Library item where it is located. You must specify a pattern to be used for the title of the subfolder when the subfolder is created. The pattern can contain text, parameters (amper variables) and, if the scheduled task is burst, the ‘%BURST’ symbol. 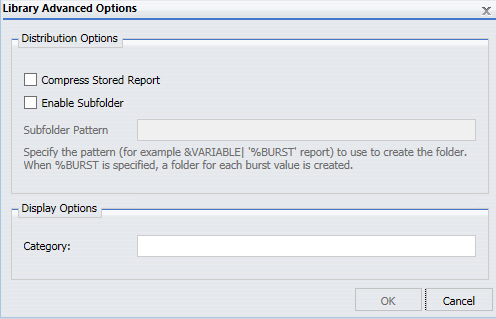 If the ‘%BURST’ symbol is used, a new subfolder is created for each burst value. You can also select the option to compress a library report when it is stored in the Repository. You also have the option to specify a Category value to help you further organize the listing of Library reports within the ReportCaster Explorer. In the ReportCaster Explorer, a Category column is available that can be selected to sort Library reports by the Category values. Note: A Library report in XML format must be opened in a new window. When scheduling a report procedure (FEX) stored in the Repository, the default location the report output will be distributed to is the same as the report procedure (FEX) being scheduled. The best practice when distributing reports to the Library is to create and specify a different folder location for each Library report to avoid name conflicts when creating multiple schedules for the same report procedure (FEX). This is important so the security access can be defined and managed at the folder level, and when selecting to burst the distributed report output because the burst value is assigned as the title value to each report section that is distributed. The title value is the value that displays in the tree. For example, the Regional Product Sales (Quarterly) report is located in the Product Information folder and is scheduled to distribute burst reports by region to the Library on a quarterly basis to the Regional Product Sales (Library Reports) folder. The Regional Product Sales (Library Reports) folder contains a library report for each region value included in the report request results. When creating additional schedules for the regional product sales report with the burst option, create and specify a different folder location because the burst report descriptions will be the same region values. Note: You can use parameters (amper variables) when specifying values for the Library fields of a schedule. These parameters can be system variables, such as &YYMD, or any amper variable for which a value is returned by the Reporting Server when the scheduled procedure is executed. To use the dot file extension separator after a variable, terminate the variable with the '|' character (for example, &YYMD|.htm). Similarly, to use the ampersand character itself, follow the ampersand with the '|' character (for example, Smith&|Jones). If a value for a parameter specified in a schedule is not returned by the Reporting Server when the procedure executes, the schedule will fail with a "No report to distribute" error. If the scheduled task is burst, you can also use the '%BURST' symbol to include the burst value. Right-click a report procedure (FEX), select Schedule, and then select Report Library. The Basic Scheduling tool displays in a new window with the Task tab selected. The Task tab contains the information on where the report procedure is located in the Repository so that the Distribution Server can access it when the schedule runs. Ensure that you complete all the fields in the Task tab. For more information about the Task tab, see About Tasks in the Basic Scheduling Tool. Select the Distribution tab. The Distribution tab contains the information on how the report information will be distributed. Verify that the folder location is the folder to which you want to distribute the report output. You can select a different folder for the report output by clicking the Folder Location button, which displays a dialog box from which a folder can be selected. You must be authorized to create content in the selected folder. The default folder location for Library output is the folder from which the scheduling tool is launched, provided that you are authorized to create content in this folder. If you are not authorized to create content there, the default location will be the My Content folder under that folder, if there is a My Content folder. If there is no My Content folder, the default folder location will be your first writable folder. Optionally, click Advanced to set optional subfolders, category, and report compression, as shown in the following image. Compress Stored Report. 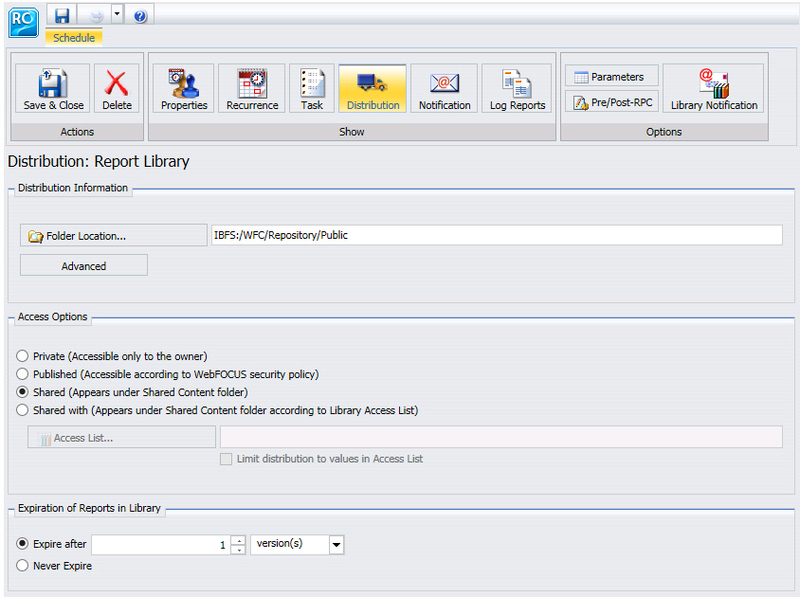 Enables you to compress a library report when it is stored in the Repository. Note: If you distribute a compressed report to the Library, consider that this may impact the response time in viewing the report. A compressed report must first be decompressed before it is sent. You should evaluate the benefits of saving repository space against the impact of the time it takes to retrieve a compressed report from the Library. Enable Subfolder. Can be enabled to indicate a subfolder to which to distribute a report. If Enable Subfolder is selected, a pattern must be indicated. A pattern can contain text, parameters (amper variables), and the %BURST symbol. Category. 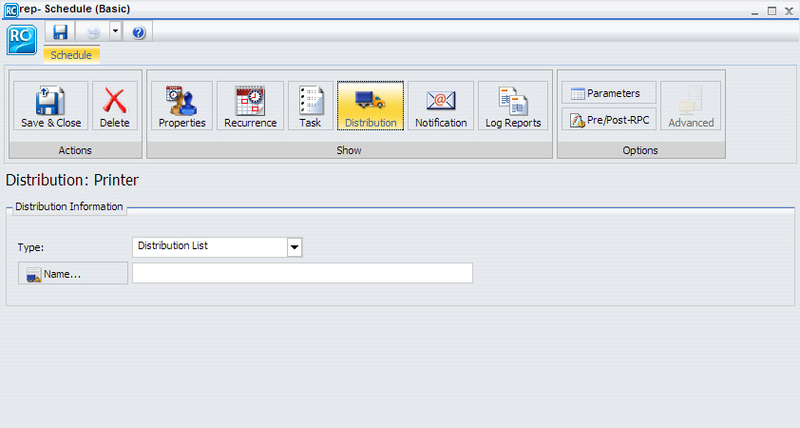 An optional value that can be used to sort library reports within the ReportCaster Explorer. For more information, see Using the ReportCaster Explorer . Select Private, Published, Shared, or Shared with to specify the groups and users authorized to access the Library report. To view a Library report, the user must be authorized to access the Report Library. Private (Accessible only to the owner). Only the Owner of the schedule is authorized to access the Library report. This is the default value. Published (Accessible according to WebFOCUS security policy). All users that are authorized to view the Library report in the folder location it is stored in can access the report. The destination folder of the Library Report must be a published folder and the schedule owner must be authorized to publish content in this folder. Shared (Appears under Shared Content Folder). All users that are authorized to view the Library report in the folder location it is stored in can access the report. The report appears under a Shared Content folder. Note: When working with a Library schedule for which the access option check box 'Shared (Appears under Shared Content folder)' and the Send Email after Report Saved to Library check box are selected simultaneously, ReportCaster will only send email messages to the schedule owner. Shared with (Appears under Shared Content folder according to Library Access List). Only the groups or users defined in the Access List, and the owner of the schedule, are authorized to access the report. The report appears under a Shared Content folder. Note: When the Access Option of an existing schedule is changed, it will be applied to all versions of the private Library report the next time a new version is distributed. Access options specified in the Library schedule are not applied to published Library Reports. If you select Access List (Shared with), select the Access List button to invoke the Open dialog box from which you can select an Access List which you are authorized to access. Additionally, when bursting is selected, you can limit distribution of the burst values to the values specified in the Access List by selecting the Limit distribution to values in Access List check box. Select Expire after if you would like the Library report to be deleted after the schedule at a later date. Never Expire is the default selection. version(s). The Report Library stores the output for the most recent number of versions specified. For example, if you specify three versions and the current version is 7, then version 7, 6, and 5 are stored in the library. However, if you delete version 6, then only versions 7 and 5 are stored in the library. If you then distribute version 8 to the library, only version 8 and 7 are stored in the library since you deleted version 6 and version 5 is not among the top three versions. Use the up and down arrows to select the number of versions. You can store up to 9,999,999 versions of a report in the library. Note: The actual number of times a report can be run is 2exp(31) -1. Never Expire. The report remains in the Report Library until it is manually deleted by the owner. day(s). The Report Library stores the report for the number of day(s) specified. Use the up and down arrows to select the number of days. week(s). The Report Library stores the report for the number of week(s) specified. Use the up and down arrows to select the number of weeks. month(s). 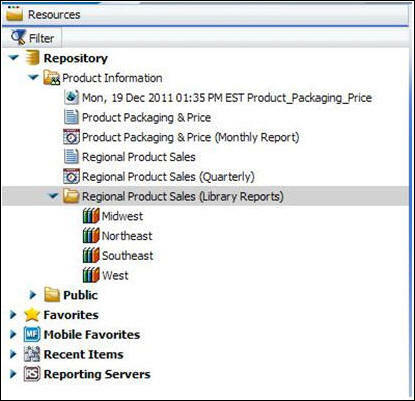 The Report Library stores the report for the number of month(s) specified. Use the up and down arrows to select the number of months. year(s). The Report Library stores the report for the number of year(s) specified. Use the up and down arrows to select the number of years. ReportCaster automatically purges expired reports one hour after the scheduled Log Purge Time. The default Log Purge Time is 1:00 AM. Therefore, the default library purge time is 2:00 AM each day. If you are an authorized user, you can also purge expired Library reports on-demand from the ReportCaster Console. The maximum number of versions of a report scheduled to the library is 9999. If you exceed this limit, the new report will not be stored and you will receive a message in the ReportCaster log file. Optionally, check the Send an Email after Report saved to Library option to send an email notification to users that are authorized to access the Library report each time a new version is distributed. The email message also contains the URL report content in the Library. Depending upon the Access Option selected, one or more users will receive a notification email. If the Access Option is Owner, Published, or Shared, the schedule owner will be notified by email when the schedule executes and output is distributed to the Library. If the Access Option specifies an Access List (Shared With), then each user on the Access List is notified when the schedule executes and output is distributed to the Library. Groups in the Access List are not used to retrieve email addresses. Only listed users will receive an email notification. Library URL. This is the URL to log on and open the Report Library. The default value is specified in the ReportCaster configuration. When a user is sent a Library email notification, the email contains a link to the report in the Library that the user is being notified about. That link is created by adding the specific report ID of the notification to the Library URL. When the link is selected, the user is prompted to sign in. WebFOCUS security processing determines if the user is authorized to access the Library report. Note: You can configure ReportCaster to not send a link containing a URL. For more information, see ReportCaster Configuration. Mail Server Name. This is the host name of the email server that ReportCaster will connect to distribute the Library email notification. From. This can be any value, for example, the name of the person creating the schedule. ReportCaster does not require a value for this field, but your email system may require one. Reply Address. The email address of the sender. This is a required field. If report recipients reply to the notification, then their messages are sent to this address. If you are authenticating to the mail server with your user ID and password, then the reply address will be the email address associated with that user ID. If the mail server is configured with authentication and the Reply Address is configured in the ReportCaster Configuration tool, then the Reply Address field in the scheduling tools will be disabled. If a Reply Address is not configured, then the field is enabled to allow a Reply Address to be sent to the email server, however the actual Reply Address of the delivered email will be that of the authenticating account. Subject. The optional text that you want to appear in the email subject line. Message. An optional message you want to appear in the body of the email notification. Select the Recurrences tab to specify how often to run the schedule. If you want the schedule to run on the current day, set the Start Date and Start Time to values later than the current time. For more information, see About Recurrence in the Basic Scheduling Tool. All other burst values not specified in the Access List are not distributed to the library. This option does not alter the running of the procedure or the retrieval of records from the data source, but simply filters the burst report sections returned from the Reporting Server based on the burst values specified in the Access List. When the Burst this Report option is enabled and the Limit distribution to values in Access List option is not enabled, ReportCaster continues to distribute all burst report sections returned by the Reporting Server to the Report Library. Upon saving the schedule, validation is performed to confirm that the schedule has the Burst this Report option enabled. If it has not been selected, a message appears reminding you that you must enable the Burst this Report option to limit distribution to values specified in an Access List, and the schedule options are redisplayed. The log file contains information specifying that the Limit distribution to values in Access List option was selected. A separate log entry appears for each Access List burst value specifying whether a report section for that burst value was distributed to the library. When distributing scheduled output to Managed Reporting	in the Basic Scheduling tool, specify the Repository folder location to which to distribute the report output. Note: You must be authorized to distribute to Managed Reporting	in order to create a schedule that uses Managed Reporting	distribution. The best practice for recurring and burst schedules is to create and specify a different folder location for each report being distributed for the same report procedure (FEX). This is important so the security access can be defined and managed at the folder level and when opting to burst the distributed report output because the burst value is assigned as the title value to each report section that is distributed. The title value is the value that displays in the WebFOCUS	tree. When the report output is distributed using the Managed Reporting	distribution option, the Day, Date, and Time information is prepended to the Save Report As value specified in the schedule task information. For example, the Schedule for the Product Packaging & Price report assigned the default Save Report As value 'Product_Packaging_Price.htm' (blanks and special characters are replaced with an underscore character). The report output distributed to Managed Reporting	on Monday December 19, 2011 at 1:35pm EST is assigned the description: Mon, 19 Dec 2011 01:35 PM EST Product Packaging Price. Right-click a report procedure (FEX), select Schedule, and then select Managed Reporting	. The Basic Scheduling tool displays in a new window. Enter or verify task information. For more information, see About Tasks in the Basic Scheduling Tool. The Distribution Server adds Day, Date, and Time to the beginning of the Save Report As value specified in the Task tab. Verify that the folder location is the folder to which you want to distribute the report output. The folder location defaults to the same folder as the report procedure (FEX) being scheduled, as shown in the following image. Users can select a different folder to distribute the report output to by clicking the Folder Location button, which will display a dialog box of the repository tree from which a folder location can be selected. The user must have must have authority to write and create content in the selected folder when the scheduled job runs for the report output to be successfully distributed. When the report is distributed, the Distribution Server adds Day, Date, and Time to the beginning of the Save Report As value specified in the Task tab. Select the Notification tab to specify whether to send an email notification of the schedule job status. For more information, see Notification Options in the Basic Scheduling Tool. If you select Always or On Error, then you must specify the Reply Address, Subject, Brief Message To, and Full Message To.